More than 200 participants are planning to march to raise awareness of the major issue of veteran suicides TOMORROW, Saturday, August 15, at 10 a.m. in St. Charles, Missouri. The 22 with 22 for the 22 March – a 22 kilometer walk with participants carrying 22 kilograms – honors the lives and service of veterans who have taken their own lives, estimated by some at as many as 22 per day. Post-traumatic stress, physical injury and a host of other factors that contribute to the extremely high rate of suicide among former military. The effort is patterned after similar marches in other cities, and is based on an idea of medically retired Marine Captain Donny O'Malley. Marchers, including veterans and civilians alike, will join together in a life-affirming way to educate the public about the problem of veteran suicide. This will be the third city in which the event, supported by Irreverent Warriors, will take place. 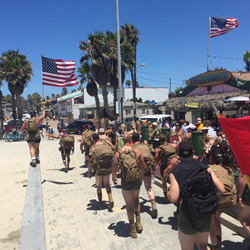 The veterans bring a light-hearted spirit to the event, with many wearing short shorts known as Silkies as they march. The route will commence at Tactical SHT at 343 North Main Street in St. Charles, and will continue to South River Road, then Friedens Road and to Hotshots St. Charles, where the march will return on the same route totaling almost 22 kilometers to a gathering at one or more of the pubs in downtown St. Charles. If you would like more information on the event.